A section of the 'feidín wall' built during the workshop. 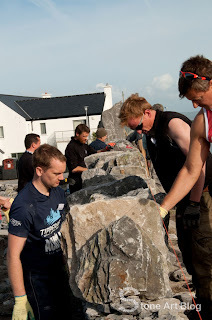 Last weekend I attended my first dry stone walling workshop on Inis Oírr Island. And I am already looking forward to going back next year. For those of you who don't know where Inis Oírr (Inisheer) is, it is the smallest of the three islands that make up the Aran Islands in Galway Bay. 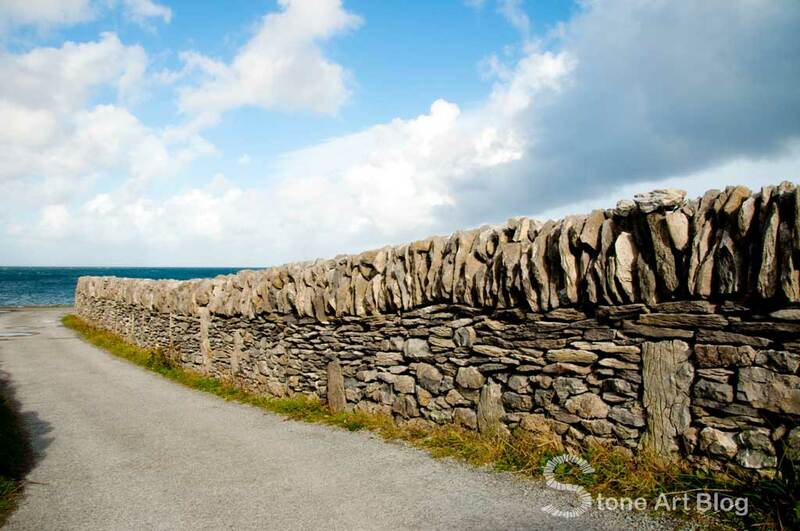 The workshop is an action of Galway County Heritage plan and is run by the country's most knowledgeable and experienced drystone waller Patrick McAfee. Pat has also written a number of books on Irish stone walling and restoration and is also a dry stone walling instructor in Dublin. This years workshop also saw guest instructors and speakers Nick Aitken and Gavin Rose. Nick is a member of the Dry Stone Walling Association of Great Britain and is a qualified Master Craftsman instructor and examiner. Gavin Rose is a drystone waller and trail builder working in the stunning Lake District National Park in England. 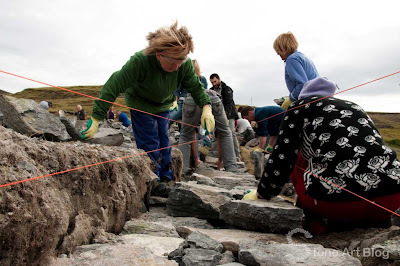 ﻿The dry stone workshop on Inis Oírr has been running since 2006. It is attended by a wide range of people, experienced wallers, stonemasons, archaeologists, geologists, self builders and anyone with an interest in heritage and stone. This year saw the largest amount of participants to date, and I suspect it will grow by next year. One of the positives I have seen to emerge from the recession we are in is that more and more people are taking an interest in our heritage and looking to learn more about the many traditional skills and crafts that the people depended heavily on back in rural impoverished Ireland, skills that are sadly being lost. 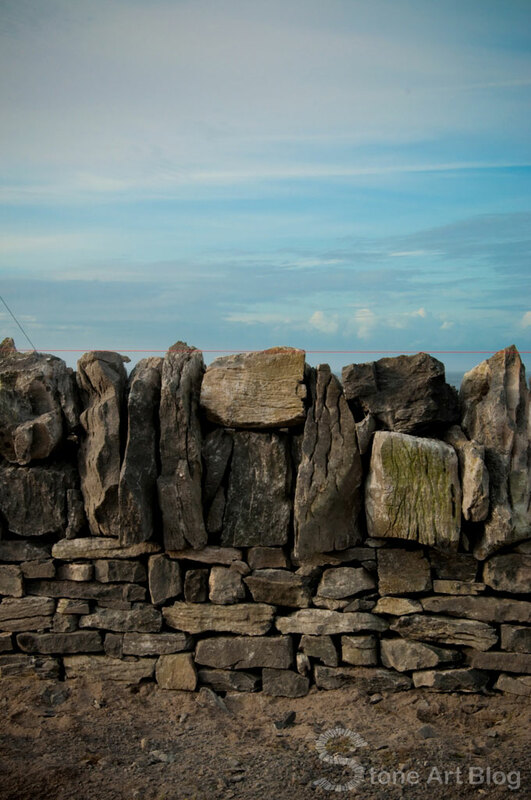 One of the most unusual and beautiful walls to be found on the island is a type of wall known as a 'feidín wall' (same type of wall we built during the workshop this year). 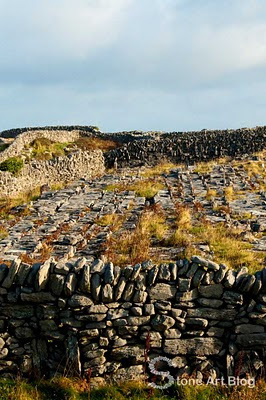 What is unusual about this type of wall is that unlike most other dry stone walls, a 'feidín wall' has the smaller stones on the bottom with the big stones on top. This type of wall is made up of a double sided wall on the bottom with a large single stone wall on top. The double sided wall at the bottom is made up of a series of large upright stones called mother stones, that run the full depth of the wall. The space between them is built up with smaller stones known as daughter stones. The upper part of the wall is then built using large stones only a single stone wide. The result is a extremely strong wall with a dense base to shelter animals and protect the soil from the strong prevailing winds, while the cracks and holes in the top of the wall let wind filter through. The light that shines through the cracks makes the wall look unstable, deterring animals from jumping on it. 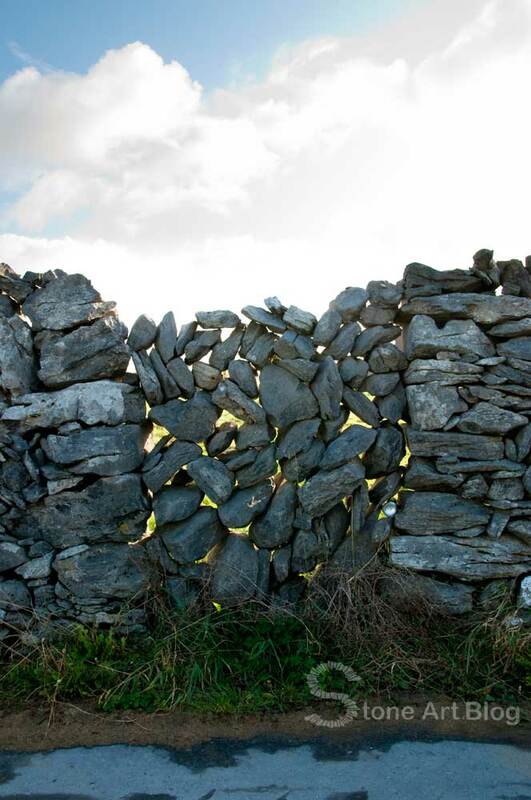 Another walling feature I was very taken by is what is known as an 'Aran gap' or 'Bearna'. There are not a lot of roads around the island so much of the access to the fields is through other fields. However you will quickly notice that there do not seem to be any gates in the walls. This is because gaps are left in the wall where a single lace type wall is stacked in the gap, which can then be easily stacked up and taken down as needed for access for animals. Inis Oírr as an island is quite a spectacular place. This year was not only my first time at the workshop, but it was also my first time visiting the island, and I must say I really was taken by the place. The island is an Irish speaking community with a population of about 250 people. And from what I can tell all 250 of them are about the warmest, friendliest people you will ever meet. The limestone pavement exposed in one of the fields after the soil has been taken by the strong winds. Inis Oírr island is basically an extension of the Burren landscape . The large limestone pavements that make up the land are made up of crisscrossing cracks known as 'grikes', that leave isolated rocks called 'clints'. The limestone dates from the Visean period, formed as sediments in a tropical sea approximately 350 million years ago, and compressed into horizontal strata with fossil corals, crinoids, sea urchins and ammonites. Glaciation following the Namurian phase facilitated greater denudation. The result is that Inis Oírr is one of the finest examples of a Glacio-Karst landscape in the world. 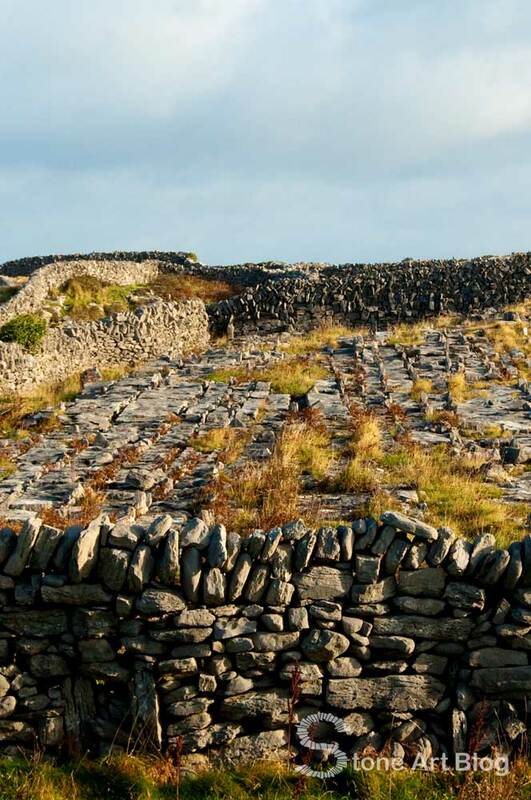 It is an amazing feat of determination and triumph over hardship, how the locals turned this once unusable limestone pavement landscape into an island of lush green fields. 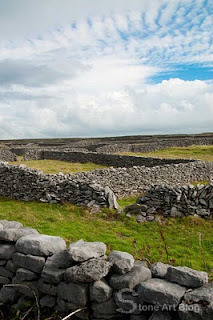 They did this by removing the rough stone to fill the cracks or 'grikes' in the limestone pavement, leaving a flat surface. 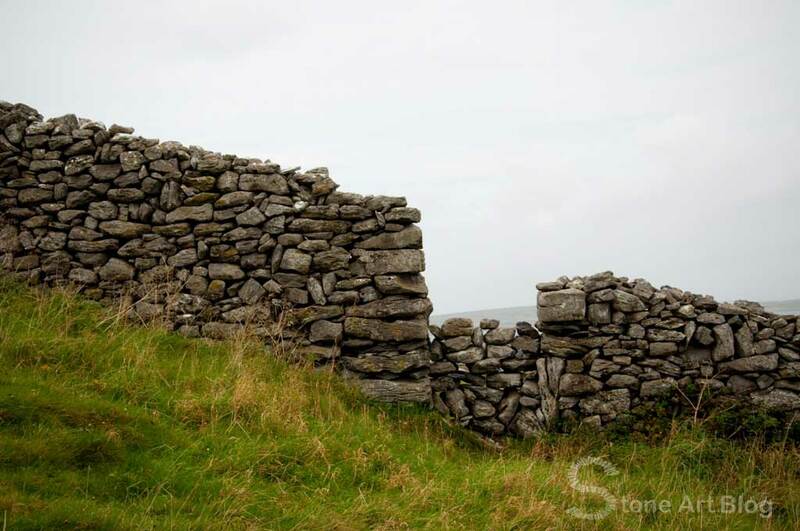 They also used the rough stone to build the walls that would later protect the fields from the wind. They then drew sand and seaweed up from the beach to create the soil, from which they would then be able to grow crops to feed their families, and grass to graze their animals. For such a small island there are also many spectacular buildings and historical sites to visit as well (and I don't just mean the great pubs) You could spend days just wandering around the island looking at them. 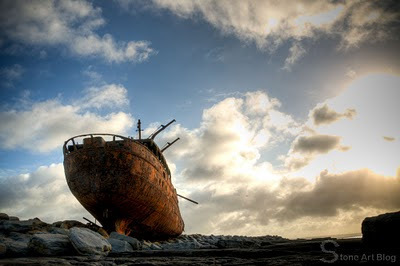 The island also has a famous shipwreck, better known from the opening credits of the TV series Father Ted. The Plassy wreck, thrown up on Finnish rock in 1960 during a wild storm. No lives were lost as the islanders saved all on board from harm. There are many more amazing things to discover on the island, but as this is just a blog post and not a book, I will leave it at that. 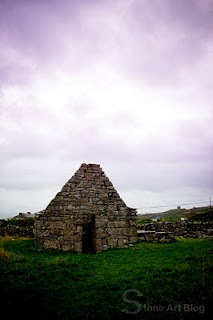 I would recommend everyone, both in Ireland and abroad to take a trip to Inis Oírr. I would also recommend that anyone with an interest in stone do one of the Dry Stone Walling Workshops out there. There are also other great ways of experiencing life on the island, as Inis Oírr also host some great Irish language courses, where you can learn the language by working and living on the island. They also have an arts center with an 'artist in residence' program where artists can take up residence and work on the island for a period of just a few weeks right up to three months. 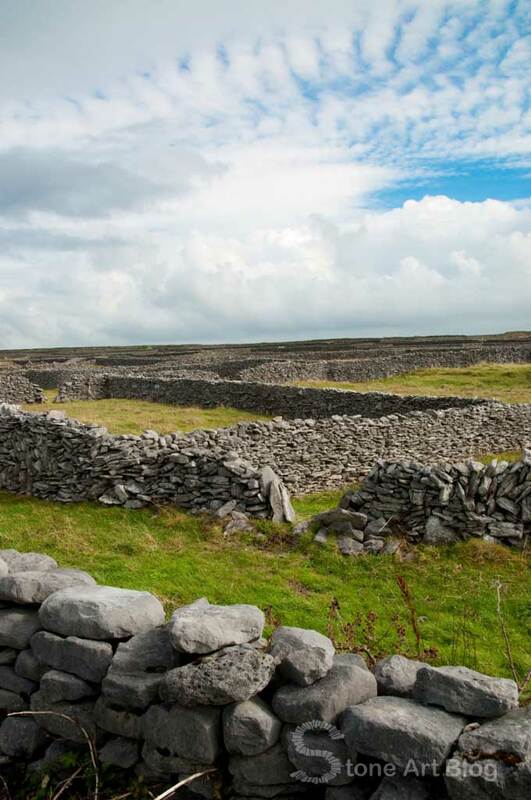 There are lots more photos of the wonderful stone walls and landscape of Inis Oírr in the slide show below. If you are interested in going to next years workshop, keep an eye out on my facebook page as I will keep you all updated from there when the dates for next years event are confirmed. 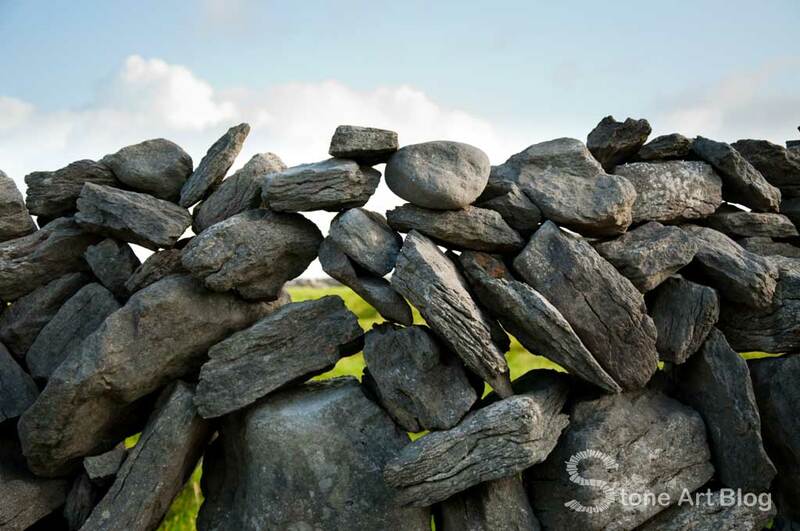 If you are interested in finding out more about the stone walls of Ireland, I would recomend checking out Patrick McAfee's book 'Irish Stone Walls' This is a great little book full of information, useful for both amateur and expert stoneworkers. 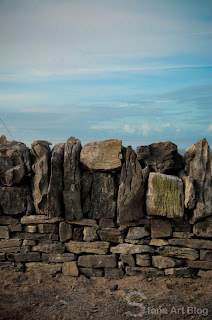 I love dry stone walling, these are beautiful photos. It looks a really interesting place. There is quite a lot of dry stone walling around in certain areas in France. There's something about a landscape with dry stone walls cutting through it, that is so near perfect. 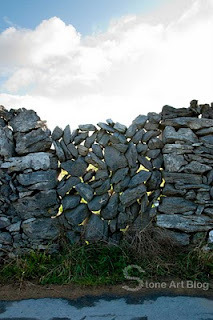 I grew up around the dry stone walls in the north of England, and was always fascinated by their construction. It's a landscape feature I very much miss living here. The Feidín walls are uniquely beautiful, I love the larger stones running across the top of the wall, and the Aran gap is brilliant! Hey Sunny so glad you posted this. Well done. I had been wondering how things turned out. It looks like everyone had a great time and learned lots. May I post some of this information on Thinking With My Hands? Beautiful. Nice work, you stoners you! I'm sure your wall will last for many generations. Please do John, use what ever you like. What a fascinating post, I've spent over an hour just taking in all the beauty of the stone walls and the landscape. Your photography is absolutely breathtaking. What a talented person you are. Absolutely stunning! Those walls are indeed works of art. I have never seen such fine craftsmanship in a stone wall. Not to mention the cleverness of the benefits they provide. I would love to go there. Hands down the most interesting post I've read in a while. Thank you so much for sharing. I am at awe of the walls and of the history of the island. I fear all my stonework would resemble the Aran gap. The lace work is interesting, that animals won't jump on it and it lets the wind thru. 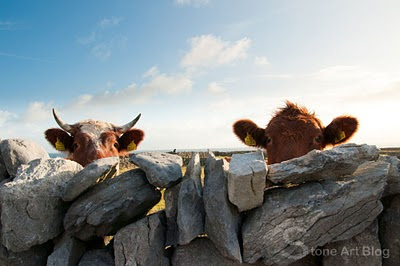 Wonder why dry stone walling is not more popular? Wonderful to see the character and quality of the indigenous walls so well honored in the new construction. Congratulations to the workshop group and instructors. Sunny - incredible, as always. You open up a whole world many of us would never know. Thank you! Super blog Sunny! Your photos are amazing! So glad to have you as a member of the DSWAI. I'm going to link to this from the dswai site. Thanks man. Hey Sunny - what a fantastic weekend it was! Your blog is so comprehensive, not only in the variety of detail, but gorgeous photos too. As for the rest of your stone work - wow!! Great Post.Thanks for sharing the link on the Aran Islands Facebook page.Comprehensive and great photos. 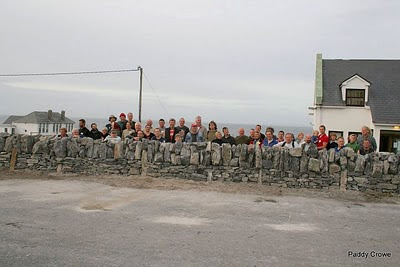 If you ever want to write a guest post on the Aran Islands blog we'd love to have you on board. Would appreciate a link from this post to our website at http://www.aranisland.info if you can find a way to include it. I'll share this post on the Aran Islands facebook page. Wonderful post! I'd love to do a workshop like this. 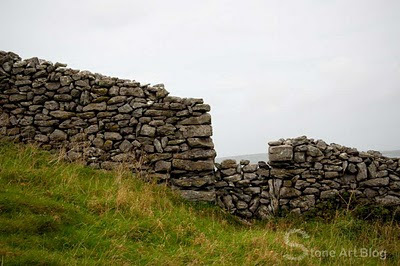 Last year when I went hiking on Inis meain I noticed the lace-type walls in the gaps and wondered what they were for. Hiking in those fields can get pretty hypnotic when you don't know your way around, but it was a beautiful experience. Thanks for the info! This is an absolutely fascinating post; I thoroughly enjoyed it - thank you! I was unaware of the Plassy wreck. One of the reasons I enjoy reading posts online is so I can find out more about my Irish roots. I dream of one day traveling to Ireland. Your posts are always so awe-inspiring! Magnificent...truly beautiful! 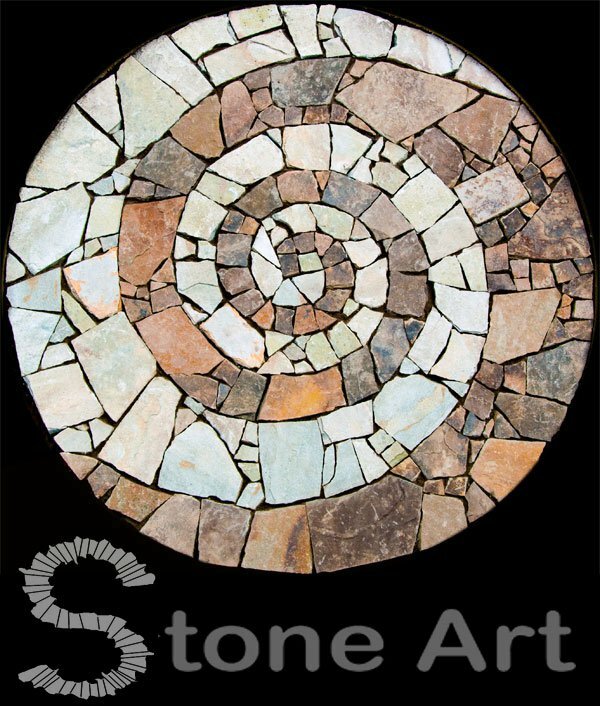 Welcome to Stone Art's Blog. 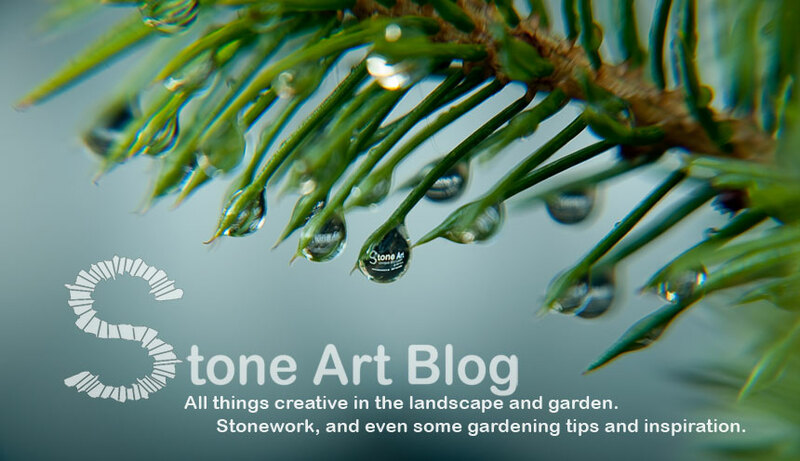 Written by Irish artist and stonemason Sunny Wieler, this blog follows Sunny's own work and experiences as well as all things creative and artistic in the landscape and garden, in particular in the medium of STONE. A flickr slidshow of some of the old stone walls that have tied the country together for hundreds of years. Be sure to check out the Dry Stone Wall Association of Ireland for more about Irish stone walls and wall building. Mypex ground cover and tips on how to fix around edging. Stone seats, the building process. Fuchsia magellanica, West Cork's adopted alien. Good news at last, The Snowdrops are up! Just a few things to keep in mind with the current wintry conditions. Roses are RED. The use of red in the landscape. Landscape Sculpture, garden sculptures, and Andy Goldsworthy. M. C. Escher and the Chand Baori stepwell in India. This year for National Tree Week, why not let the trees do some art!!! Turning old instruments into art! Because we like Stone so much we gave it, it's own post list. Jeffrey Bale's Mosaic Pilgrimage, a labour of love, a labour of pebbles! Stone Chairs. Some ancient some not so ancient…Yet…. All Ireland Scarecrow Championship, Durrow, Co. Laois. Encore from the musical tree, to celebrate arbor day! Bloom 2010, Ireland’s largest gardening, food and family event. Glendalough, Monastic City, Co. Wicklow. Sheep grazing at Newgrange in the Boyne Valley. The strive for a greener garden centre. Publishers Weekly Gives Gardentopia a Starred Review! Nikon D90 Blog - D90 Everything! Living Stone Masonry - Living Stone Masonry's blog about stonework in the NC mountains. Mark Di Suvero De-installation: " Are Years What?" 3D models soon to be unveiled at the Smithsonian Institution. The 'Moon Seat’ at Anne Hathaway’s Cottage, Stratford-upon-avon. New LOGO design process - what fun! A new Year and a new beginning! The Garden Blog Directory - Great gardening and landscaping blogs are all listed here!